When one walks among a forest of native plants, plants who have lived together for hundreds or thousands of years, there is an obvious feeling of harmony that is different from what one feels when walking among a forest covered with honeysuckle, kudzu, multiflora rose, Japanese knotweed and privet. In the forest of ancient harmony, it appears plants are each given their respectful place of existence, room to grow and breed unimpeded by aggressive competition from other plant species. The healthy balance of this forest isn’t based on the behavior of what is above, but actually, the health depends on what lies below the surface: the relatively undisturbed soil and hidden mycelium of the forest Fungi Kingdom. The Fungi Kingdom is perhaps the oldest group of living species, which made the earth inhabitable for plants. Fungi consist of the visible fruiting bodies called mushrooms, and the threadlike mycelium network underground and throughout decomposing matter, such as fallen trees. According to mycologist Paul Stamets, roughly eight miles of mycelium is living in one cubic inch of ground. Stamets also describes underground mycelium’s neurological network like the Internet, constantly giving and receiving information. Mycelium know when we are treading on them. Fungi, unlike plants, contain no chlorophyll, though they do use radiation-as plants use light-to convert elements into food, and their byproducts during this conversion are what makes soil by which plants can live. Rotting mushrooms feed microbes, which in turn feed the forest. The relationship of symbiosis is very important when it comes to the Fungi and the Plant Kingdom. Many native plants depend on particular mycelium species in the soil in order to live, making them difficult to transplant or propagate, and thus threatening their population status. The symbiotic relationship makes plants sensitive to habitat destruction from farming or prior farming and development-roads, subdivisions, strip-malls, cities. Once the soil habitat for particular mycelium is disturbed, the native plants living in the symbiotic relationship will struggle to live. Plants who are not sensitive to particular mycelium species, and perhaps attracted to nitrogen-depleted soil are opportunistic, and easily become invasive when the healthy balance is disturbed. Other opportunistic species are viruses and microbes. In our gut is approximately three-five pounds of bacteria, which provide a foundation for our immune system. A disturbance in the friendly bacterium’s habitat can allow opportunistic pathogens to thrive. As Louis Pasteur, father of the germ theory, exclaimed in epiphany, “It’s the milieu!” Germs, microbes, pathogens take advantage of a weakness in the environmental system and proliferate. This is a similar pattern of behavior in invasive plants. When we see invasive plants, we are seeing a symptom of ecological disturbance, not the cause of ecological disturbance. The total ecology, or relationship of organisms and elements, is far-far-far more complex than people understand. It is not as simple as pulling out privet and planting native species, as if that would perpetually remain a native-only plant place. To rid the area, no matter how small or large, of invasive plants would require toxic herbicides, causing further ecological distress, or an introduction of a predatory species– which I assert is always a short-sighted and regretful idea–and constant vigilance in tending the “natural” native garden. Birds, animal fur, clothing and wind will continue to disperse seeds, making the maintenance of a native-only plant place a constant, resource-draining effort. And underlying the whole attempt, literally, for the survival of the native plants is the necessary re-establishment of the symbiotic mycelium. A cost-benefit analysis would help here. We need to recognize some of the phytoremediation benefits of non-native, invasive species, such as with mimosa as a nitrogen-fixer, or purslane as an absorber of PCBs, or lamb’s quarters as a re-vegetation plant for mining sites and absorber of organophosphates. Furthermore, once invasives become the predominant species, they are performing the ecological benefits of erosion control, holding up our creek banks, and converting CO2 from our atmosphere into oxygen. My Athens Banner-Herald column has received some criticism when I write of the virtues of an exotic, or a non-native, invasive species, for instance, with mimosa and purslane. One of my graduate school teachers, the eminent Dr. Jim Duke, retired from the USDA, and author of nearly 100 books on medicinal, economic and agricultural plants, as well as ethnobotany, and who developed and maintains the valued Phytochemical and Ethnobotanical Database, definitely doesn’t think that the U.S. should plant more kudzu, but he does recommend that we utilize the kudzu for biodiesel, food, phytoestrogen isoflavones-important for women during menopause, and as a medicinal aid for alcoholism. We should not pollute our water through the massive, and expensive, application of herbicides, trying to eradicate kudzu, or introduce a pest which has unintended consequences. We need to utilize the plants growing abundantly around us, and to do that, we need to know what their benefits are. Through the gained knowledge from research of invasive species, we can learn how they are medicinal substitutes for threatened native medicinal plants, for example Japanese barberry (Berberis thunbergii) is a medicinal substitute for the threatened goldenseal (Hydrastis canadensis). To me that sounds like sustainable practices of plant harvesting, and sustainable stewardship. Finally, the term “native” is quite arbitrary. Humans have been trading plants since we were able. Plants provide life-saving medicine, and have inspired seed swaps and spurred the global marketplace; the need for healing bridged the divide of differences. For example, in the 8-9th century, Emperor Charlemagne developed relations with Arab Muslims, who were more medically advanced than the Roman Empire, and instructed his officers to collect medicinal plants to bring back to Christian monasteries where they were grown in physic healing gardens. Comfrey (Symphytum officinale) is one of those plants. In fact, it’s a custom in the old world of the Middle East to travel with a plant. Furthermore, if one looks specifically at the pre-Columbian history of America, one will see the trade of plants from east to west, north to south. 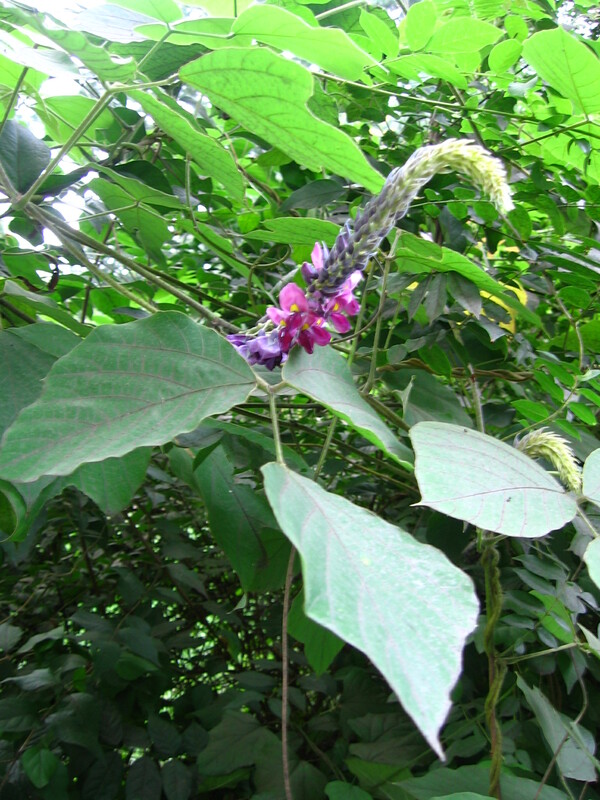 Some of these plants naturalize in their new environment, essentially “going native”, and can become included in human botanical texts of native species. Almost all plants are designed to disperse their seeds or spores through various mechanisms. It’s the compensation for being rooted to a place, the way to travel and increase one’s progeny. In untended circumstances where the human is not the gardener, the seed grows where it can. Within a paradigm of a whole webbed universe, as in Cherokee stories, it might be said that the seed goes where it is called. 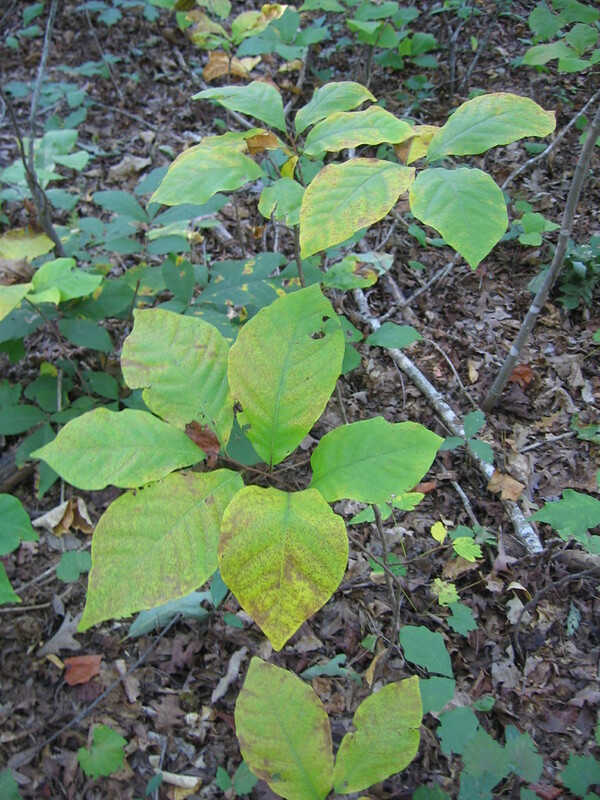 For instance, poison ivy, a North American native, could be considered “invasive” today because it isn’t a desirable plant to most humans, and, being spread by birds who eat the berries, it shows up all over the eastern U.S. In Cherokee stories of natural history, there are 7 tribes of plants. One of those tribes is the warrior tribe who protects other vulnerable plant tribes from animal predators, or helps restore an area from disturbance. Poison ivy is the chief of the warrior tribe. Blackberries and smilax are also native American plants in the warrior tribe. In this perspective, poison ivy is doing its job, trying to keep humans away from more vulnerable plants, or helping a disturbed area to heal, which is why it’s so prolific in the eastern United States. Next time you see poison ivy growing, notice where you are. What disturbances have taken place? What plants might the ivy be protecting from you? Pay attention to the plants that begin to reclaim an area that’s been developed. My mind goes to the old houses on secondary roads covered in kudzu, or the weeds coming up through the sidewalk cracks. These are called invasive, but they also demonstrate how awesome is nature’s power of reclamation and, hopefully, restoration. To learn more about the importance of mycelium, watch Paul Stamets at the 2008 TED Conference on the vodpod video in the right sidebar. To learn more about Dr. Jim Duke’s solutions for kudzu, visit his Green Pharmacy website. Depending on one’s perspective, when lamb’s quarters volunteers itself in your yard, garden or field, it’s either a welcome wild vegetable or an unwelcome weed. Scientific research takes one side or the other: either it is a promising plant for world food security and an excellent way to clean up toxically contaminated sites, or it’s a weed for which people develop new herbicides to eradicate. 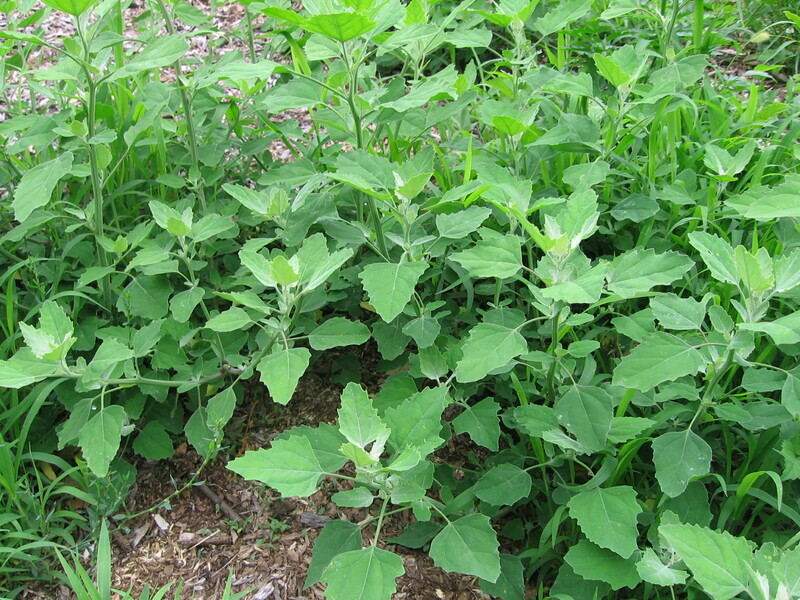 Lamb’s quarters (Chenopodium album), also called white goosefoot and fat hen, is an introduced Eurasian species found in most of North America, and is related to the Andean quinoa grain (C. quinoa). Its upper diamond-shaped leaves look as though they’ve been dusted with white powder, and the stem of the more mature plant is vertically striped yellow, green and fuchsia. This annual prefers sunny, moist, cultivated soils; however, it can also grow through gravel, demonstrating its tolerance for difficult, abusive situations. Being a culinary vegetable staple in Old World cuisine, lamb’s quarters was introduced early in the colonization of North America. It spread throughout the continent and was quickly adopted into the diets of many Indian Nations, including the Iroquois, Cherokee, Navajo, and Eskimo. In ethnobotanical accounts, many nations ate the young shoots of lamb’s quarters boiled, and then cooked with grease. Cherokee ate raw greens as a salad for good nutrition. Shoots and seeds were dried for winter food storage. The seeds have been ground into flour for bread and made into porridge. Medicinally, in addition to being a nutritious vegetable, the Navajo used lamb’s quarters as a topical poultice dressing for burns, and more unusually would make snake figurines out of the young shoots to use as antidotes for snakebites. Recently, lamb’s quarters has been found to prevent the proliferation of two strains of breast cancer cells. Researchers in South Africa have looked at the nutritive quality of lamb’s quarters and its potential for providing food security. They found lamb’s quarters to be as high in minerals as spinach, lettuce and cabbage, and a good source of micronutrients, such as cancer-protecting flavonoids and polyphenols. As a vegetable cooked like spinach with butter or olive oil, lamb’s quarters has a pleasant taste which pairs well with many types of meats or beans. When cooked with beans, lamb’s quarters shows its hidden carminative benefit, neutralizing the undesirable, gaseous effects of bean dishes. Ecologically, lamb’s quarters provides an economically and environmentally beneficial answer to wastewater contamination from agricultural fields. Studies show that lamb’s quarters growing in agricultural ditches absorbs organophosphates and pyrethroid (permethrin) pesticide runoff, and polychlorinated biphenyls (PCBs), all very toxic compounds capable of disrupting human hormones. Lamb’s quarters also holds promise in the re-vegetation of mining sites. Which perspective of lamb’s quarters will you have when you see it growing into your life? If you need more persuasion, you can sample it from Athens locals who are choosing its benefits by selling it at the farmers markets. Athenians can also find lamb’s quarters growing along roadsides and the North Oconee River Greenway. If you find and harvest lamb’s quarters, keep in mind that it’s an annual. If you don’t leave some to go to seed, it will cut down on the chances of having lamb’s quarters around the following year. Cut the stem above the last “good leaf”, above any yellowed leaves. If you don’t use lamb’s quarters right away, you can wrap them loosely in newspaper and place in a plastic bag. That will keep the lamb’s quarters fresh in the fridge for a week or even two. Lamb’s quarters can be dried or frozen for future use, as well. When you’re ready to cook lamb’s quarters, you’ve got as many options as you do with other greens. Strip the leaves from the tougher, lower, stems. The tops are tender enough that you can cook and eat the stems if you like. You can chop the leaves further, or leave them whole. I add a cup of water to a stock pot, and place on low-medium. Add the lamb’s quarters, some green onion, and a splash of vinegar. Put a lid on the pot, and stir occasionally. Cook for about 8 minutes. The greens get slightly steamed and boiled. If you choose, you can sautee garlic and onions in butter on the side and combine it with the cooked greens before serving. Lamb’s quarters can be cooked into soups and casseroles, quiche, or a greens pie. This article was published in the Athens Banner-Herald, July 11, 2010. Yesterday I was walking my dog to the Daily’s Coop in Athens, GA to get my local eggs and vegetables. Fay, my dog, stopped in front of a business and started rolling all around in a spot on the grass. I couldn’t see a dead animal carcass, so I didn’t stop her. She was enjoying herself. Then I noticed spots of the lawn were a funny, fake blue-green color. 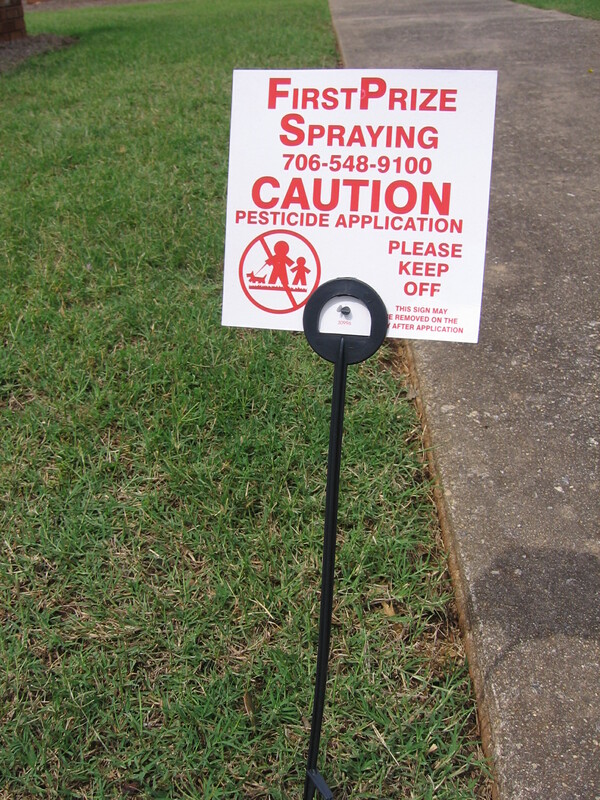 I turned to my right, and there, on the edge of the lawn, was a dinky sign informing the public that the lawn has been treated with toxic chemicals and children and pets should stay away. Oh. That’s nice. 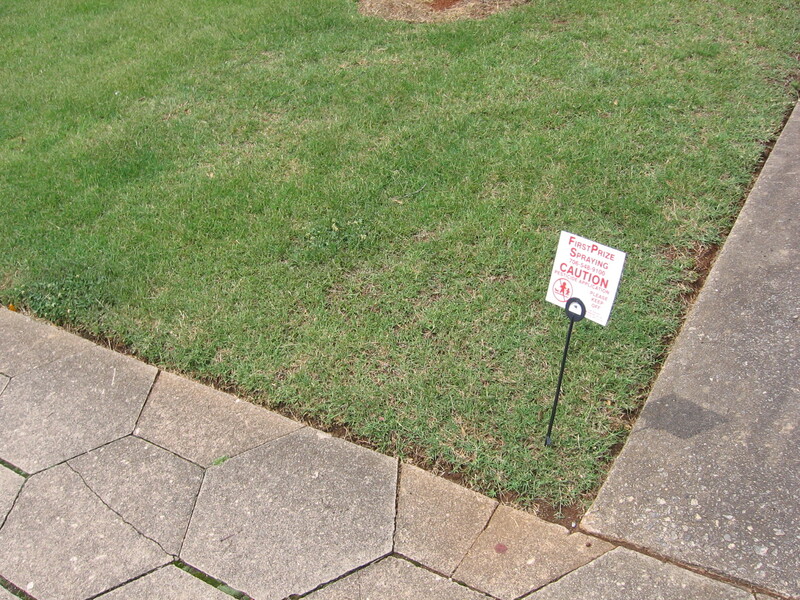 First of all, the herbicides they used do not stop at the lawn. During last night’s rain the chemicals were washed into our water treatment system. Secondly, whoever was paid to spray the chemical is also being poisoned. And last, it should be required for pesticide companies, and businesses and homeowners who choose to poison the place, to post bigger noticeable signs with a skull and crossbones when they do poison the neighborhood. I forgot to mention why they were using the poison in the first place. It was on the cute little clovers! 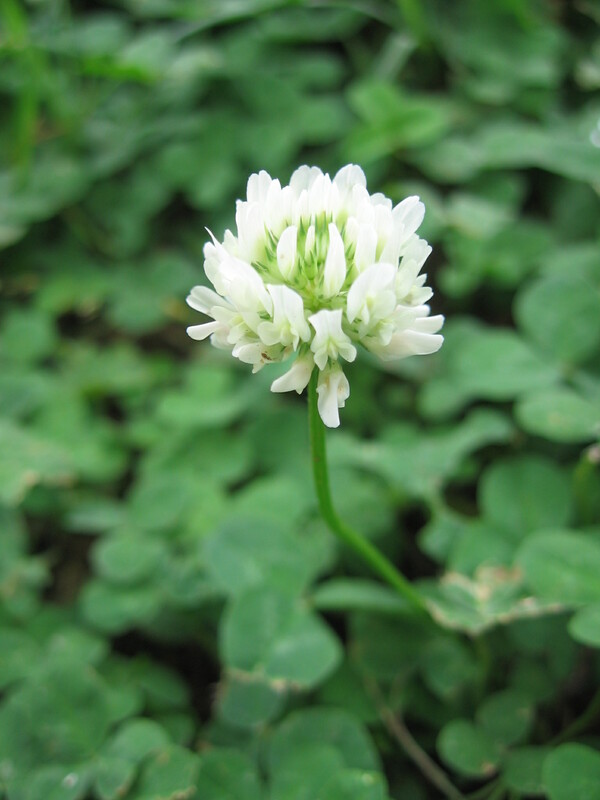 Trifolium repens “is considered to be a beneficial component of natural or organic lawn care due to its ability to fix nitrogen and out compete lawn weeds. Natural nitrogen fixing reduces leaching from the soil and can reduce the incidence of some lawn diseases that are enhanced by the availability of synthetic fertilizer” (The Organic Lawn Care Manual, Tukey, Storey Publishing. p 183.; Wikipedia). In this case, nature is healing the lawn, but the health practitioner who occupies the property doesn’t understand that. If humans were wise, we would use our sophisticated ways of knowing, i.e. science, and choose actions that did not hurt ourselves. We would know that working with nature’s processes is CHEAPER and HEALTHIER than pesticides. Instead, we give billions of dollars to a government that will force us to have health insurance because we are likely to develop heart disease and/or cancer from the toxic farming practices allowed at the expense of our (and our children’s+) livelihood for businesses to make money. In addition to lawn spraying, we’re also soaking our food in the chemicals. The USA allows a lot of agricultural chemicals to be used in the growing, shipping, and preserving of our food. Even chemicals that have been banned in the USA, such as DDT, are showing up on our produce when tested by third parties. The main class of chemicals being used legally is called Organophosphates. They are also considered the most toxic. Organophosphates are cholinesterase inhibitors. Cholinesterase is an enzyme in the neuromuscular junctions. Some of the signs and symptoms of acute Organophosphate poisoning is: muscle weakness, tremors, anxiety, headaches, drowsiness, confusion, ataxia, hypotension, difficulty breathing, convulsions, coma, decreased sperm production, mutations, and infertility. This class of chemicals is linked to long-term illnesses such as Parkinson’s Disease, autoimmune diseases such as Lupus, ADHD, neurological disorders, female reproductive disorders and many cancers. Even 48 hours after exposure, when traces have left the blood, clinical signs can be noticed for weeks. If you would like to research Organophosphates yourself, begin with http://www.atsdr.cdc.gov/toxicprofiles/tp84-c2.pd. This is an enormous pdf from the CDC Division of Toxicology and Agency for Toxic Substances and Disease Registry about the health consequences of agricultural chemicals from scientific studies. Look at Chlorpyrifos, which is a common Organophosphate. Not a nice chemical that we want on our food. New scientific studies are finding that long-term exposure or ingestion of these chemicals, especially mixed with multiple other chemicals, are causing disease. We need to urge American farmers to use health-promoting practices, not health-degrading practices. If you go to PubMed (this is a free database of scientific, peer-reviewed journal articles paid for by USA tax dollars and developed by NIH and NLM), search ‘farmworkers’ AND ‘pesticides’. You’ll find lots of terrible side effects of agricultural chemicals, and the poor outcome for farmworkers who are exposed to these chemicals. The way for evil to triumph is for good people to do nothing. Let’s do something.